Over 5 million kids in the United States suffer from hearing loss. Teach your kids healthy hearing habits now, to prevent hearing loss later in life. You take your kids for regular check-ups at the doctor and the dentist, and you get their eyes checked at the optometrist. But what about their hearing? Healthy hearing helps them develop language skills and excel in school, and keeps them socially engaged with their peers. Kids often have a habit of turning the volume up on the TV, the radio and the computer so that nothing else around them can be heard. As the parent, turn the volume down, and let them get used to listening at a reasonable level. Toys for kids that make sounds or play music are often too loud for your kids’ ears – and even for yours. Put tape over the speakers on these toys to dampen the sound, saving your kids’ hearing and your sanity. Sound-limiting headphones limit the sound to a non-damaging level even at maximum volume. These are a must for children using hand-held music players. If your child is listening to music with regular headphones or ear buds, make sure you remind them often to keep the volume down. The sound should be kept at a level where only they can hear it. If anyone else can hear the music from their ear buds, it’s too loud. Shows and concerts are often too loud for children’s unprotected ears, but that doesn’t mean they should miss all the fun. 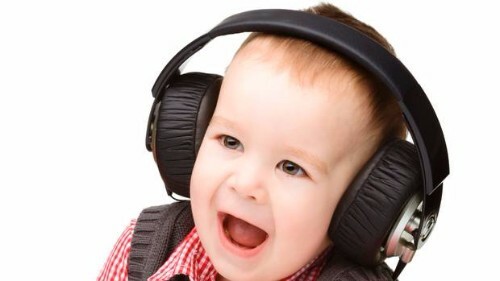 Have your young ones wear sound-dampening ear muffs or earplugs, and set a good example by wearing them yourself. Start them with this habit early, so when they’re older and going to shows without you, they’ll already be in the habit of protecting their ears. Treat your children’s hearing with as much care as you treat their eyes and teeth. Get their hearing checked regularly, and show them how to practice good hearing health. They’ll be glad you did.